Go buy it so we can get more manga like this from Viz! Links to purchase:AmazonBarnes & Noble Continue reading Ouran High School Host Club Volume 18 is out from Viz! I just got Lala 9 today and there’s an Ouran special chapter in it! There I will postpone the last two releases scheduled this month to get that out ASAP.The chapter will be continued into Lala 10! 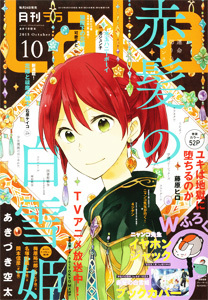 Ouran will also be on the cover of Lala 10! So we will be getting at least 2 special Ouran chapters! Yay! Kuro Lala!! There also something call “Kuro Lala” (Black Lala) coming out in September. This is part of Lala magazine’s 35th anniversary. I will do my best to get my hands on this Special collection of material from the folks at … Continue reading New Ouran High School Host Club Special Chapters are Coming!! Kuro Lala!! and More!! Ouran Volume 16 is Available from Viz! I meant to announce this weeks ago. Sorry :(. Anyhow, “Ouran High School Host Club” volume 16 is available now from Viz. I recommend this translation over anything available in scanlation. It is superior :). The book is available now through the special Ouran section I set up in the Omari’s Sister Amazon Store. Click here to buy and support Ouran, Hatori-sensei, and Omari’s Sister with your purchase :). Continue reading Ouran Volume 16 is Available from Viz!